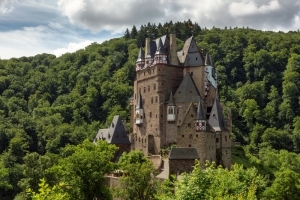 As an eternal guard perched on a rock above the river Elzbach, the Eltz Castle is a genuine example of a medieval knight’s castles. 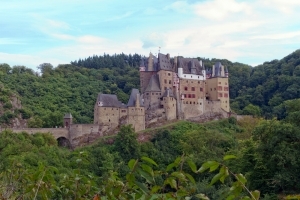 Over a number of centuries, the castle belonged permanently to the same house of Eltz aristocrats, whose descendants have allowed it in modern times to be partly sightseen. 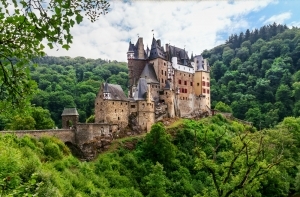 An engraving of the Eltz Castle was used on the German 500 Deutsche Mark note for many years, making it one of the most recognized symbols of Germany. 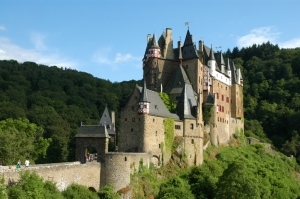 Today, as in the past the Eltz Castle is in possession of the Eltz family, for 33 generations. The present owner of the castle Karl Graf von Eltz Kempenich lives mostly in Frankfurt am Main, so the greater part of the castle is accessible for travelling groups. Walking tour takes about 40 min. During that time, you can visit some outstanding castle rooms and see the collections, acquired by the castle’s owners for eight centuries. Jewellery as well as various objects rarely seen or even unique in the Middle Ages are kept in the castle’s treasury. From the 13th to the 16th century, the castle was subjected to several phases of extension. As a result, ten towers in different architectural styles have been constructed in the inner courtyard. These towers were inhabited by various Eltz families and were named after the names of their inhabitants – Riebenbach House, Rodendorf House, Kempenich House, Plattelz House. After reconstruction in the 19th century all the houses were combined into a single structure at the highest floor level, but previously they were separated. Their hosts were living in relationships, which were very different from the family ones. In the Riebenbach House you can find interior decorations, which are typical for a noble house from 15th-17th centuries. There are rich collections of weapons and old paintings by representatives of Cologne School of Painting in this tower. On a protruding balcony of the Riebenbach House a Gothic chapel, whose external appearance and decorations are still in almost original condition, was preserved. The Knight’s Hall located in the Rodendorf House impresses with its size and interior. At times, all knights of the stronghold used to get together for discussions in this greatest of all castle chambers. On the walls of this chamber you can see the carvings of jesters’ masks, which symbolise freedom of speech, among other heraldry exhibits. The jester has the right to say anything without fear of negative consequences in the medieval period. After sightseeing, tourists who want to commune with nature alone far from roads and achievements of modern civilization can make a walk along special walking paths around the castle’s surroundings. 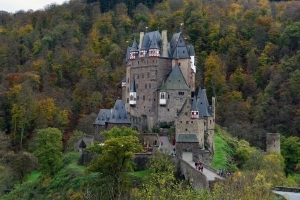 More than 300 hectares of the Eltz Forest growing in the valleys of the Elzbach River have been recently declared a nature reserve. There are several routes and trails intended for tourists, depending on their fitness level. Some of them are suitable for a walk, others seem to be difficult to overcome. Such a walk may take even a few hours.